New bathroom mirror. Note the gouge in the wall made by its predecessor during its tragic fall from grace and a plate hanger. On Friday morning, I found my bathroom mirror propped up in the sink, which was not at all where I left it the previous night. Curiously, the plate hanger from which it had been suspended lay on the floor like a chalk outline. The mirror itself was not really a mirror but a drinks tray that came as part of an overly festive glassware set, but it looked positively forlorn with large cracks down its glittery back and sad little chunks torn out. I didn’t have the heart to throw it away, so it lay on a kitchen counter until Pete Harrrumphed and took it out to the trash. 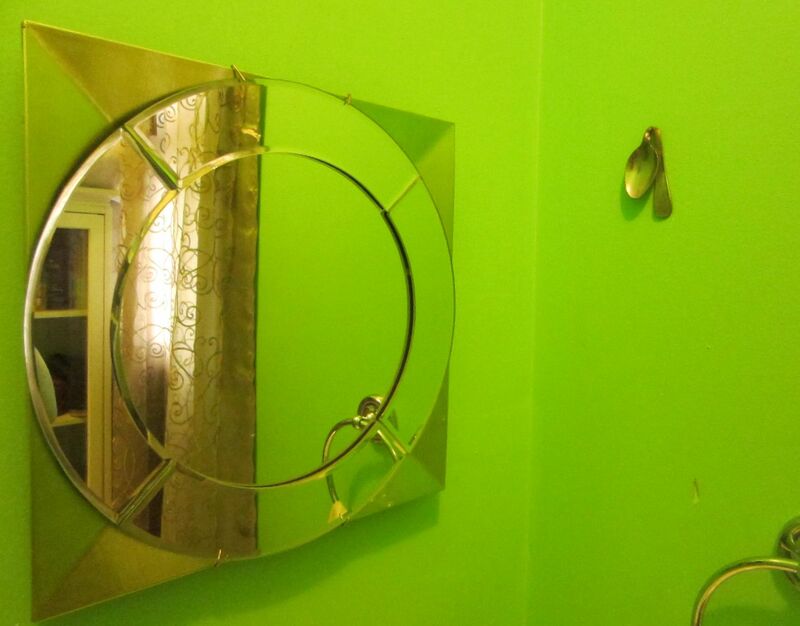 Of course, I couldn’t replace it with a regular old bathroom mirror. That wouldn’t be silly enough, but this Pier One holiday plate and a lightweight plastic charger is practically its own punchline. But wait – there’s more! Turns out a superstorm, a Nor’easter and Thanksgiving weekend were not enough. South Jersey also had a small earthquake. I do not live in South Jersey; however, as far as I know, my bathroom mirror was the only damage. This entry was posted in This Never Happened To Pablo Picasso and tagged diy. Bookmark the permalink. Pablo Picasso likely didn’t have cats. The best move my rescue kittens have engaged in lately was to hide the wash bottle (a plastic bottle with an L-shaped nozzle) that I was using to keep them from running out the door. I have yet to find it. Your cats are terribly clever. And fond of Pyrex. They have excellent taste.